Following hot on the heels of the David Gilmour Live at Pompeii worldwide cinema screenings (on September 13th), comes the release of the same name on a variety of formats. September 29th sees the arrival of the recordings on 2CD, Blu-ray, 2DVD, a 4LP boxset, a Blu-ray and CD deluxe edition boxset, and via HD digital downloads. 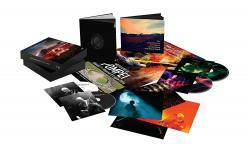 Other gems too are present on the deluxe boxset, including the acclaimed BBC documentary Wider Horizons. On July 7th and 8th last year, David performed two spectacular shows at the legendary Pompeii Amphitheatre in the shadow of Mount Vesuvius, 45 years after he first played there for Adrian Maben's classic film Pink Floyd Live at Pompeii. The concerts were the first-ever rock performances played to an audience in the ancient Roman amphitheatre, which was built in 90 BC and entombed in ash when Vesuvius erupted in AD 79. David was the first performer to play to an audience in the arena since the time of the gladiators, almost 2,000 years ago. The concert performance film, to be included in the DVD/Blu-ray options, was shot in 4k by director Gavin Elder and includes highlights from both shows. The concert is a spectacular audio-visual experience, featuring the famous huge circular cyclorama screen as well as lasers, pyrotechnics and even a return to the traditional lighting used in AD 79! Ordering details for all the various formats are shown here; below those are the details of the formats/track listings.